Milarepa (aka Milarepa: Magician, Murderer, Saint and The Life of Milarepa - Part I; 2006) is a film about Jetsun Milarepa (1052-1135), one of the most famous and revered of all Tibetan Buddhist Lama/Saints . The film covers the early, sorcery period of Milarepa’s life, prior to his conversion to Buddhism. 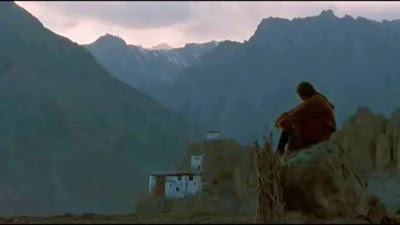 An interesting feature of the film is that it was made by Tibetan monks and shot with local, nonprofessional actors in the picturesque Spiti Valley in northern India near the Tibetan border . Indeed, the film’s director and co-scriptwriter, Neten Chokling, is, himself, an important lama from Bhutan who was recognized at an early age by the 16th Tibetan Buddhist Karmapa as the reincarnation of an eminent earlier Buddhist lama [3,4]. Chokling has long been associated with another Bhutanese lama/filmmaker, Khyentse Norbu, and he most likely learned much about filmmaking from his participation in Norbu’s films The Cup (1999) and Travelers and Magicians (2003), on which he had small acting parts. In addition, one of Neten Chokling’s teachers, Orgyen Tobgyal, is another important lama in the Neten Chokling Rinpoche family line (people in this culture can be linked to a family line by religious certification that they are reincarnations of earlier family members), and he plays a significant role as a key yogi/tutor of the protagonist in Milarepa  (he also had a small role in Norbu’s The Cup). 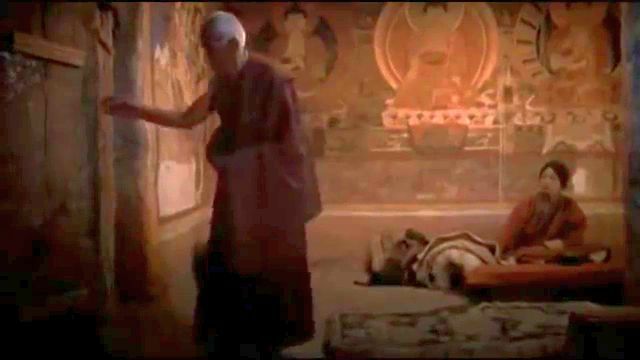 Thus the film probably has a more Tibetan Buddhist practitioner’s focus on this depiction of their saint’s formative years, and this is a general perspective that the film presumably shares with Khyentse Norbu’s films. Stylistically, Chokling seems to have learned from his work with Norbu the production skills associated with the latter’s adroit use of picturesque long shots that are combined with expressive closeups and which together offer a uniquely expressive philosophical visual landscape. This story of Milarepa’s early years follows traditional accounts and passes through three phases. During this early period of his life, prior to his conversion to Buddhism, he was known by his given family name, Mila Thopaga. Thopaga is born into a prosperous Tibetan family, but at the age of seven, Thopaga’s wealthy father becomes mortally ill. The father formally confers the guardianship of his wife Kargyen (played by Kelsang Chukie Tethong) and his son to his brother and sister, and he gets their solemn promise that they will pass onto the boy his rightful inheritance when he comes of age at sixteen. 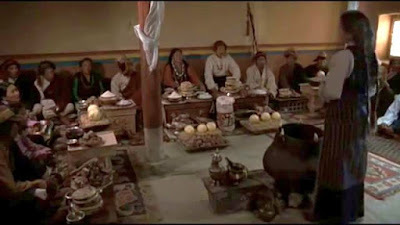 However, immediately on the father’s death, Thopaga’s greedy aunt and uncle confiscate the deceased father’s wealthy possessions and subject Kargyen and Thopaga to menial servitude. When Thopaga (Jamyang Lodro) reaches the age of sixteen, his mother, hopeful that justice will be restored, hosts a coming-of-age ceremony, at which she formally requests before the community that Thopaga’s inheritance be bestowed on him, as had been promised. But Thopaga’s uncle angrily dismisses the request and says the family wealth all belongs to him. He rudely shoves Kargyen to the ground, and a scuffle breaks out, during which the assembled community members show no support for Kargyen and Thopaga. Kargyen is humiliated and vows revenge. 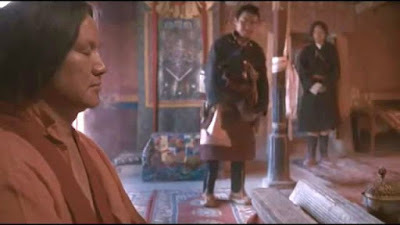 Thopaga sets off on his journey to study sorcery under renowned master Yongten Trogyal (Orgyen Tobgyal). Hearing about his nephew’s intentions of learning sorcery, Thopaga’s uncle gathers a posse to chase after the boy and thwart his plans. However, a fortuitous or magical intervention by Yongten Trogyal’s son, Dhama, casts a spell of confusion over Thopaga’s pursuers, and the boy arrives safely at the yogi’s remote mountainside residence. There Thopaga learns various sorcery techniques. all intended to deliver great harm to one’s enemies. None of the techniques, it seems, can be used to bring about good or loving connections. But Thopaga feels that the magic he is learning is not strong enough to carry out the vengeance he is seeking, so Yongten Trogyal sends the boy to an even greater sorcery master, Yonten Gatso. After spending fourteen days entrapped continuously meditating in an enclosed stone cell, Thopaga finally acquires the vast powers he is seeking. He returns to his village. Upon Thopaga’s return, he stops by a mountainside outside his town and uses his newly acquired magical powers to conjure up a devastating storm to strike his village. 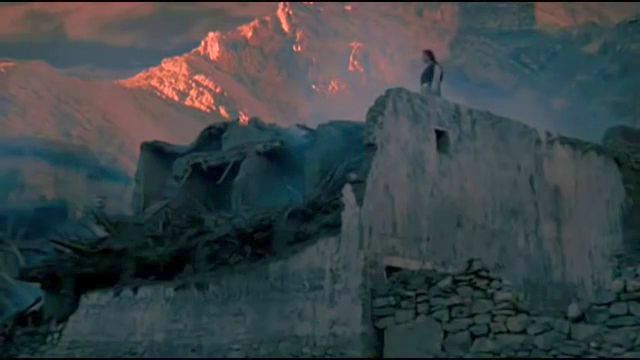 The storm demolishes the village and kills 35 people, but Thopaga’s uncle and aunt somehow manage to survive. Thopaga’s mother, Kargyen, joyfully and triumphantly celebrates her revenge. For her, long-sought justice has finally prevailed. But Thopaga is disturbed when he sees all the suffering he has wrought. Nevertheless, when his uncle discovers Thopaga’s whereabouts on the mountainside and leads another group of surviving villagers to capture him, Thopaga uses more magic powers to launch a massive rockslide that devastates his attackers. "Cease negative actions, cultivate positive actions, and tame your mind." So Yongten Trogyal decides to send Thopaga to what he believes is the most enlightened master, Marpa the Translator (aka Marpa Lotsawa). The film ends with Thopaga setting off on that journey to Marpa in order to acquire the true compassionate enlightenment of Buddhism. Most religions, it seems, have a major theme of vengeance to them. There is a strong emphasis on punishing sinners, and this is called “justice”. I once asked a friend of mine, who was a former Baptist minister, what he thought about punishment. Isn’t punishment primarily intended as a deterrent, I asked – a threatened outcome that is intended to deter future wrongdoing? No, he responded, punishment is “justice”, itself. For people along this line of thinking, there is some abstract bookkeeping system in the sky that must be kept in balance, and this has nothing to do with deterrence. A wrongful deed, they say, must be punished, full stop. This is a response to the visceral feelings of resentment and revenge that can affect most people. And this is what Yongten Trogyal’s powers were used for in the story – to harm one’s enemies, who are supposedly guilty in some way. Indeed Yongten Trogyal ruefully laments at one point in the film that his powers cannot be used to save people; they are only used to exert harm. But there are spiritual teachings that can point us in the positive directions of love and compassion, and Buddhism encompasses some of those teachings and practices. Milarepa tells the story of a man who acquired awesome powers of vengeance-inspired retribution. But he voluntarily renounced those powers and the path that led to acquiring them, because he knew, inside himself, that this was the wrong way to go. He didn’t need to be told this by a teacher; the inner-god within him (“The Kingdom of God Is Within You”, following Tolstoy) led to this conclusion. It could be said that a weakness of the film is that it focuses too much on Milarepa’s (Thopaga’s) involvement with revenge, and doesn’t cover his period of spiritual enlightenment. But this film is unlike most films about vengeance, which typically place a great emphasis on the atrocities that have inspired the feelings of revenge. In contrast here in Milarepa, there is relatively scant coverage of those revenge-inspiring events. Instead, the focus is on Milarepa’s turning – his inner journey of discovery and turning away from vengeance and resentment. And that is why this film, despite its varioous rough edges, is interesting. Still, it would be nice for us to have a film from an authentic Tibetan Buddhist perspective covering the remaining portions of Milarepa’s story – Neten Chokling only had funds sufficient for filming the first part of Milarepa’s life. Fortunately, there is such an account available in the form of a multimedia work consisting of static images, text, and atmospheric background music – Milarepa: Murderer and Saint . This was put together by Orgyen Topgyal Rinpoche, whom I identified above as a lama and close associate of Neten Chokling (he was one of Neten Chokling’s tutors) and Khyentse Norbu. The text presented in this work is mostly derived from the traditional Tibetan Buddhist account of Milarepa’s story, The Life of Milarepa: A New Translation from the Tibetan . From this we learn that Marpa the Translator was a very difficult and demanding master, and Milarepa’s path to enlightenment under his tutelage took a number of twists and turns in the second half Milarepa’s story. This multimedia presentation, Milarepa: Murderer and Saint, is available on Youtube as nine linked chapters . It has a contemplative mood, and it emphasizes the value and virtues of serious meditation as a path towards enlightenment and universal compassion. So I recommend it to those who are interested in this subject. “Milarepa”, Wikipedia, (9 May 2018). Dennis Schwartz, "Earnestly capturing in spirit the emergence of a holy man", Ozus’ World Movie Reviews, (11 May 2008). “Orgyen Tobgyal”, Wikipedia, (18 April 2018). Heruka, (Lobsang P. Lhalungpa, translator), The Life of Milarepa: A New Translation from the Tibetan, Penguin Books, (1 February 1992). Abstract. 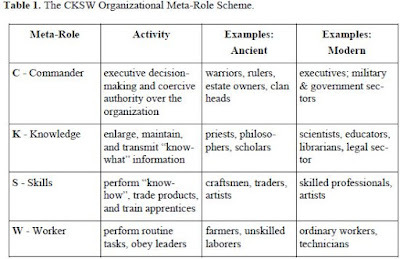 The paper describes the CKSW (Commander-Knowledge-Skills-Worker) meta-model, developed for the purpose of representing arbitrary social systems across various levels of social organisation. It affords opportunities for modellers who want to move beyond folk-psychological models to the level of folk sociology. A key feature of this model is the distinction between knowled­ge and skills, to offer more refined capabilities of explaining economic and social development in primitive and modern societies as well as in organisations. We present the motivation for this model, followed by a description of its structure. The model’s suitability to retrace social and institutional phenomena on an abstract level is explored using historical and contemporary scenarios. Modelling complex systems by means of multi-agent system modelling offers several advantages to the analyst. For example it offers a way of decomposing a problem into simpler components, since the agent components of the complex system can be considered to be relatively autonomous and equipped with their own goals and capabilities. In addition, seeing the world as made up of a collection of goal-oriented agents is a natural cognitive attitude for us. We often have a tendency to see complex phenomena, such as violent weather patterns, as if they have agent-like autonomy. In addition, when we are faced with the task of engineering and deploying a system to carry out a complicated set of tasks in a dynamic environment, it can be useful to structure such a system by employing multiagent-based concepts. The reason is that multiagent systems are often scalable, modifiable, and relatively robust in the presence of changing environmental circumstances. In this connection we tend to use folk-psychological models of agents as our building blocks. The agents are considered to have a simple set of goals, beliefs, and capabilities that has come to be described loosely as a BDI  (belief-desire-intention) model of agency. G. E. P. Box once remarked that "essentially, all models are wrong, but some are useful", , and in this case, although we know that the BDI model of agency is not a precise characterization of human cognition, this folk-psychological characterization has proven to be useful to the multiagent system modelling community. Nevertheless, in this paper we present an expanded view of multiagent systems that incorporates higher-level social modelling constructs based on “folk sociology”. To go further in our complex modelling capabilities, we believe that there are lessons to be learned from the consideration of natural biological evolution on earth, which we can view as the evolution of natural collections of multiagent biological systems. In the early stages of this evolution some 2-3 billion years ago, single-celled organisms spread across the earth and apparently comprised a complex community of bacterial interaction [7,22]. But in these early stages of evolution, there was only one level of agency – the bacteria. Later on, more complex forms of life successfully evolved into multicellular organisms that formed and engaged in multiple levels of interaction. Today we observe that many of the higher forms of life manage to succeed or not on the basis of whether their social organizations are successful in their eco-environments. Til now, multiagent system modelling community has largely concentrated on the single agent level, corresponding to the bacterial level of natural evolution, and its mostly one-to-one interactions with other agents. To make further advancements, we need to expand our understanding of multiagent systems that are operating on the social and organizational levels. In fact given the increasing degree to which information and communication technology is embedded into the real-world processes of human activity, we believe that it is necessary to focus our modelling interests on complex systems made up of multi-levels of agents that may have complexities at the human level. Thus although the BDI agent model has proven useful for the development of interaction mechanisms among agents – including interaction protocols, norms, policies, and institutional rules, we believe that there can be benefits to expand on this folk psychology model and incorporate “folk sociological” models based on human sociology that can guide the construction of multiagent systems operating in more multi-levelled complex societies. To this end we will present our CKSW meta-model for social organizations in Section 3. But prior to that, we will in the next section briefly invoke an additional modelling metaphor that may prove useful for consideration of social organization evolution. While one could attempt to model the appearance of social organizational structures purely in terms of naturally emerging structures (as in the case of biological evolution), we think it is useful to recognize that a great many social organizations have been artificially constructed, full-blown, by their human creators. In that case we can think of agents creating organizations whose roles and institutional mechanisms can be regarded as constituting their essential structures. The success of organizations that succeed and prosper may, in the long run, be due not so much to the individual attributes of particular group members but more due to the features or their general role structures. In this respect we can invoke the metaphor of the “selfish gene” – the evolutionary survival of social “organisms” is determined by their gene structure, as measured by their general social role structures. With respect to this evolutionary perspective, we can then imagine agents creating organizations, whose roles and institutional mechanisms represent the organizations’ genetic structures. In this realm, it is the evolutionary success of the social organization that matters, and that is determined by the degree to which its “genes” contribute to its survival. The roles that most contribute to organizational success will be recognized as successful elements by organizational creators and propagated into future organizations. These roles, by the way, need not be characterized by BDI rationality; they may be merely outlined by characteristic instincts, heuristics, and habits. To outline a structural framework within which we can cast this genetic structure, we now turn to our CKSW meta-role model of organizational structure, which was initially introduced by Purvis and Purvis in the referential context of service-dominant logic . From the earliest periods, humans have worked together in groupings whose activities have been enhanced by shared, coordinated arrangements. Generic characterizations of these arrangements, i.e. institutions, are represented as systems of beliefs, rules, goals, narrative, norms, and organizational structures . Although the original human group formation was the clan and based primarily on kinship, the advent of structured institutions extended the possibilities of human social organization, thereby affording opportunities offered by specialization, complementary cooperation, and trade. Thus although it is customary to attribute group success to the capabilities of the leaders and commanders, we also much acknowledge that a crucial aspect of successful operation of these extended organizations has been their exploitation of “intelligence”, i.e. the degree to which they have been able to acquire, and exploit, and sustain knowledge and skills. Commander (C) – they have ultimate authority over the operation of the organization. Knowledge (K) – people who possess, manage, and transmit institutional knowledge. Skill (S) – craftsmen and skilled workers. Relatedly, they are also the traders who engage in the exchange of the crafted items. Worker (W) – ordinary laborers, farmhands, and factory workers. Commanders. All societies are characterized by some form of leader or commander (C), whether as an individual or a select group of decision-makers. The core feature of the commander sector of a society is its monopolization of authority and coercive control on the societal activities. Knowledge. A second social pillar is that associated with knowledge (K). It is characterized by managing the development, storage, and sharing of knowledge. Knowledge is represented in the form of knowledge structures, such as organizational rules, procedures, and legal constraints – as long as they can be expressed in written words or verbally communicated. Depending on the size of the social system, knowledge can take various forms. On a macro-level encompassing an entire society, the knowledge component entails the institutional structures governing the society, along with the moralistic and ideological narratives upon which those structures build. Examples include religious leaders, guardians of the legal framework (such as the high courts), and academic institutions. In addition, the media are important factors in connection with how the knowledge is disseminated and shared. Skills. The third cornerstone is represented by the skill (S) sector, which is distinct from the knowledge sector (see the discussion in the next subsection). The definition of a skill must essentially reference the practitioner’s embodied frame of reference, and in various contexts may encompass physical dexterity, socially coordinated action (plays in team sports such as basketball), improvisation (such as performed by dancers and musicians), and social skills (the intuitive ability to interact concurrently with a collection of individual personalities). Worker. The worker sector, usually representing the bulk of the population, is involved in the performance of (often coordinated) established and mundane routines devoted to the sustenance of the society of which they are a part. Although individual workers may have individual, personal skills, they are not skill specialists and are not members of the skill sector of the society. Note that a fundamental aspect of the CKSW formulation is the distinction between skills and knowledge, and this is further discussed in the next subsection. There are numerous, various descriptions across a number of academic and technical communities concerning what constitutes knowledge and skill (known since early Greek philosophy, respectively, as epistêmê and technê). For our purposes here, we simply identify knowledge with the commonly held understanding that knowledge represents what is believed to be “true”. In other words, our knowledge represents a mental model of an objective aspect of the world around us. As such knowledge is characterized by passive conceptual structures that can be accessed mentally. This passivity of knowledge structures is to be distinguished from the active capabilities we employ in our interactive, situated contexts. These latter active and operative capabilities we call “skills”. Thus, for example, we might have knowledge of the names of the fifty states in the United States, whereas we have the physical capability of riding a bicycle, we would call a skill, not knowledge. A key aspect of knowledge is that it can be passed on and communicated to and confirmed by others. This means that knowledge must be expressible in form of linguistic representation and that it can be submitted to some form of logical manipulation. This is the power of knowledge: it can be represented in language and communicated rapidly across the globe in the form of text via books, newspapers, and now via telecommunications. Skills, on the other hand, are associated with an ability to interact meaningfully and successfully in one’s environment. The skill capability is intimately connected with the embodied interactions that gave rise to it and typically does not entail an easily communicated mental model. Skills are usually communicated via a master-pupil instructional relationship, whereby the master guides the pupil to interactively operate in the desired skillful manner. A convenient way to express the distinction between knowledge and skill is to say that knowledge represents “know what” and skill represents “know how”. Note that because knowledge inherently means something that can be expressible in language, it has given rise to what Preston has called the “sentential assumption” , which assumes that humans have the capacity to represent knowledge in their minds by using internal “mentalese” lexical knowledge structures. Thus all mental processes inside the brain are assumed to be quasi-linguistic in nature . From the perspective of those hold the sentential assumption (which includes a large proportion of cognitive scientists and computational science academics), all intelligence is represented inside the brain as knowledge. The skill-oriented intelligence which is so hard to communicate to others is still presumed by these people to be represented somewhere in the brain as lexically-oriented mentalese knowledge, but it is assumed that we merely have difficulty accessing it and expressing it to others. In other words, the intelligence is still there in lexical format, but it is just below the radar of our own intellectual reflective capabilities. This has led Polanyi and others to refer to this supposedly existent but unavailable for articulation knowledge as “tacit knowledge” [3,4,29,30]. In line with this thinking, the agenda of the artificial intelligence community from the 1980s has been directed towards building a knowledge-based representation of human mental content . Irrespective of whether you hold to the sentential assumption (we do not) and believe that this impossible-to-articulate lexical knowledge is stored in the brain in lexical format, the difference in transmission/transfer capabilities between the two forms of intelligence (knowledge and skills) gives practical grounds for placing them into two separate organizational categories. We restrict our use of the term “knowledge” to that which can be explicitly articulated in lexical form. In fact phenomenologist philosophers have always made a point of highlighting the distinction between knowledge and skill, although they have tended to use different terminology. For example, Heidegger alluded to this distinction when he distinguished between two modes of encounter things in the world – either as “ready-to-hand” or “present-at-hand” . According to his scheme, we can look at an artefact such as a hammer according to two dispositions: in ready-to-hand terms it is a tool used for pounding, while in present-at-hand terms it is a physical object with objective properties independent of its potential use. Thus a hammer in Heidegger’s account would be associated in its ready-to-hand context with know-how, while in its present-at-hand context a hammer would be encountered as an object of knowledge (know-what). And for Heidegger, the know-how of readiness-to-hand was primordial, while the know-what of presence-at-hand was derivative. In analogous fashion, Merleau-Ponty refers to the primordial nature of skill-based interactions when he writes about the “intentional arc” . Merleau-Ponty sees us as invariably embodied agents, and the “intentional arc” refers to the manner in which we have a tight feedback-based engagement with the environment. Intuitively, according to Merleau-Ponty’s account, the agent seeks to maintain a “maximal grip” with what it encounters by continually reconfiguring itself by means of small physical adjustments in order to maintain an optimal interaction. Thus when one rides a bicycle, one is continually maintaining a maximal grip in order maintain the proper balance and direction of the bicycle. This is not based on any acquisition of or references to stored knowledge, but is instead an operational disposition by means of the intentional arc. Novice – the practitioner faithfully follows a basic rule set of what to do in basic situations. Advanced Beginner – there is a limited degree of situational perception that is not recorded or characterized by written information and that can be used to supplement the rules. Competence – the practitioner develops a more hierarchical rule and plan set such that particular sections of it can be applied immediately to perceived situations. Proficient – the performer’s rule-and-principle-based theory of what to do is gradually replaced by “situational discriminations accompanied by associated responses . . . and intuitive behaviour replaces reasoned responses.” . Intuitive recognitions are prominent here, but rational decision-making is still involved. Expertise – the performer not only intuitively sees the problem, but also intuitively sees what needs to be done to solve it. Thus, for example, the expert driver not only feels when slowing down is required, but also knows how to perform the proper action without calculation or comparing alternative options. Thus Dreyfus sees that within an individual’s mind varying forms of fruitful interaction between a person’s skill (S) and knowledge (K) take place, depending on how much skill the person has. Also, like Heidegger and Merleau-Ponty, Dreyfus feels that knowing-how (S) is more fundamental than knowing-what (K). So far we have discussed the differences between knowledge and skill at the personal level. In fact we can think of the CKSW scheme as applying at a number of levels. At the personal level, the Commander mode of thinking is associated with decision-making; the Knowledge mode is associated with rational reflection; the Skill mode is associated with skillful action; and the Worker mode is associated with routine embodied actions. So at the personal level, everyone has CKSW modes of action. In fact even a robot can manifest the CKSW modes. From the perspective Rodney Brooks’ subsumption architecture , one can think of robotic subsumption levels encompassing the CKSW roles, with decision-making (C) at the top, below which are a knowledge-management (K) level and a skill (S) level (e.g. avoiding walls), with a bottom-layer worker (W) level representing basic actions such as locomotion. But our focus in this paper is at the societal level, and there the CKSW meta-roles refer to people who primarily operate in the society or organization with these capacities. A schematic outline of this scheme is presented in Table 1. The elemental nature of these meta-roles can be seen by their original presence as the four basic varnas (primordial castes) in the late Rigveda period of traditional Hinduism some 3,000 years ago: Kshatryas (C), Brahmins (K), Vaishyas (S), and Shudras (W) . Over the course of history, these meta-roles have continued to play significant roles in the operations of societies. Traditionally however, histories, often directly commissioned by the Commander elements, have placed their main focus on how the leaders and rulers affect societal outcomes. Of course, the Knowledge sector has also been understood to play an important role, since that group maintains and transmits the institutional norms, narratives, and belief systems that provide an underlying social scaffolding and help sustain a society’s progress. In recognition of this importance, rulers (C) have traditionally sought to influence and control the dominant social beliefs (K) and how they are expressed and transmitted in their realms. For example the earlier Chinese emperors have long attempted to associate an officially approved Confucianism in order to maintain a social glue across their domains . More recently, economic historians have placed a greater emphasis on the importance of the skills and trading sector for the success of a society [16,17,24,25]. Initially long-distance trade was undertaken by placing good and an armed contingent on a commissioned ship bound for a foreign port. Upon arrival, the goods were sold under the protection of the soldiers on board. But this cumbersome arrangement was eventually replaced by merchant-trader coalitions in various locations who established institutional mechanisms in order to guarantee the secure exchange of goods and payments. This was achieved by a gradual evolution from the employment of informal norms to the establishment of formal sets of rules to lock out cheaters and free-riders. Thus the first distributed, open-access institutions with well-defined contracts and rules arose, bottom-up, out of the skilled trading community (S), rather than top-down from the Commander and Knowledge (C & K) sectors [16,18]. In light of these more recent studies concerning the importance of the skilled sector, one may be tempted to consider that perhaps too much credit for the rise of modernism and its crucial institutional mechanisms has been given to the Scientific Revolution (the K sector of society). Surely the Scientific Revolution was important, but the contributions of the skill/trading sectors of society were likely at least as important for these fruitful developments. In particular it is the tight interplay between the K and S sectors of a society or organization that is crucial to success. As alluded to above in connection with Knowledge (K), the CKSW meta-model can be applied on different social levels: the society level, the group level, and even the individual level. Thus each individual can be understood to have various and context dependent CKSW capacities within itself. And then that individual can play different CKSW roles within the various groups of which it may be a member. For example, an individual may be responsible for the performance of routine tasks (W) at its workplace, act as a leader (C) in connection with its local sports team, and participate in a musical orchestra (S) at other social events. Likewise the K of a society (or any other role for that matter) can be decomposed into sub-groups or individuals, which observe the overall objective of K but operate in vastly distributed roles within the social systems that constitute K. Let us take the press as an example, which is constructed of individuals that bear the creative process, i.e. S (e.g. illustrators); individuals that perform the knowledge distribution, i.e. K (e.g. writers); individuals that operate the actual printing press in a routinized manner (W); and finally administrators, such as editors, that oversee the entire operation (C). Note that as one moves upward into higher levels of social organization, the CKSW roles become more specialized and entrenched. While individuals can perform situational shifts at a local level, their allocation in an organizational or societal context is less fluid. The multi-layer nature is schematically depicted in Figure 1. A social system of interest can thus be abstractly defined as a social organism that embodies the CKSW roles as structural elements, which is equally applicable for individuals as well as social systems individuals are members of. In contrast to individuals, however, social systems can consist of further nested subsystems, while individuals represent the atomic social entity in a society. Figure 2 provides a semi-formal representation of the CKSW meta-model in conjunction with the social organisms it affects. Beyond describing the basic structure of a society, the meta-model also specifies the relationships among its entities. In this regard we believe that instead of proffering a fixed specification of interrelations (which will inevitably be challenged by the inherent complexity of social systems and their multiple levels), it is better to offer a range of examples that explore some of the possibilities of those social roles in different contexts. In a first instance, we can instantiate the CKSW model in the context of primitive hunter/gatherer societies, such as the Polynesian and Native American societies described by Diamond , that initially build on stratification into C, K and W – with C represented as the tribal leader, K represented as the spiritual leader (or “medicine man”), and W represented as the ordinary villager. While C makes operational decisions such as resource distribution and maintains control over power, K takes on the role of knowledge bearer. K is authoritative with respect to behavioral norms, in-group conflict resolution, health, and in the wider sense, and general cultural authority (e.g. privileged spiritual connections to ancestors). In this sphere, K has an advisor role with influence on C’s decision-making. In the developmental progression of such a society, one might observe small acts of experience-driven innovation, such as the improvement of hunting weaponry. Individuals or sub-groups (often initially sourced from W but leading to the establishment of S) may develop novel skills that impact the overall society, such as the development of agricultural principles and the domestication of animals. Such innovations can not only change the social work structure, but also perhaps alter the rights and obligations of C to govern such resources and of K to maintain developed factual knowledge. Thus skilled members (S) generate innovations that expand know-how by combining existing K with new practices. In the hunter-gatherer example, new skills (S) might emerge spontaneously, but historically the role of C on social development has been a major focus of attention. For example, central to thesis of Acemoglu and Robinson  concerning social economic development is the necessity of transitioning from what they call extractive institutions to inclusive institutions. Extractive institutions extract wealth from the populace and the commons in order to maximize tributes to the sovereign, a commonly observed pattern for colonized societies; whereas inclusive institutions are those in which the sovereign redistributes and shares his power. By having C shift from a selfish maximizer to a social mediator, the increasing autonomy and self-determination inclines individuals to pursue their goals and foster innovation – and to return to the CKSW metaphor: to allow S to flourish. The leaders and commanders (C) commonly exploit the K sector in order to achieve their goals. These operations are often expressed in the appropriation of control over media to suppress dissent, as commonly observed in coercive regimes. C naturally relies on the existence and functioning of K as both an infrastructure for information transmission, but also a source of stability and socio-social identity. K, in contrast, underlies the C’s coercive control, but may also exert indirect power over the government or ruler by influencing opinions of the society at large. A historical example of C’s attempt to control K was the Elizabethan Settlement  in England that united the diverse socially disruptive and conflicting strands of Christianity under a common roof, the Church of England, by redefining the associated institutions and appointing the representative sovereign as its leader. Such C-K power relations are dynamic and may be disrupted by the activities of S. For example, S can likewise be source of innovation and change with influence beyond an individual society’s boundaries. This is exemplified by the degree to which C’s ability to control K is challenged by the increasing internationalization of K based on the development and wide-spread availability of new communication technologies (the printing press in previous centuries and ICT, such as social media, today). Thus new ICT, offering individuals a wider source of information, has had potentially disruptive consequences on C and K, as observed in the recent Arab Spring revolutions. This has led to countermeasures such as Turkey’s recent ban of Twitter usage prior to local elections . Figure 3 schematically depicts the dynamics described in connection with these foregoing examples. However, as much as the change of the institutional landscape is often initiated by social rulers, the creation of beneficial inclusive institutions is a process that can be driven by forces that act on the level of the governed. An important example displaying the interrelation of this dynamic is the development of the lex mercatoria, or law merchant, which is nowadays considered a foundation of international law and which emerged from the practices of long-distance trade . Trading across territorial boundaries at the beginning of the second millennium was a highly profitable but likewise risky endeavour, promising travelling merchants significant gains for shipping demanded goods across medieval Europe, such as skins and wool from Northern Europe to the South, in exchange for perfumes and spice, which were a rarity in Northern Europe. However, traders could not assume enforcement of contractual obligations, property rights, and safety of travel once outside their domestic boundaries in which they had citizen’s rights. Realising the benefits that could be gained both from making demanded foreign goods accessible (as well as the fiscal benefit of taxation) led local rulers and warlords (C) to offer (implicitly multilateral) commitments guaranteeing the safety of foreign traders within their territorial boundaries. This led to competition to develop international market places based on the implicit effect of standardizing the institutional environment with respect to trade. In this case the benefit offered by an initially small number of trade innovators (S) – the provision of desired foreign goods along with the economic benefit from taxation – afforded a bottom-up establishment of institutions in which trade practices fertilized and nourished the rule formation processes on the part of C and K.
Thus in the instance cited above, C opportunistically nurtured a bottom-up development on the part of S that led to long-term social benefits. In general, though different roles have their specific obligations, they have multi-directional dependencies. This often involves rulers (C) paving the fundamental institutional landscape, with K maintaining it, but also with influence from W and S in particular, who develop social practices that stimulate their manifestation as explicated institutions, such as norms and rules along with societal values. As one further example of the formative role of S in the context of institutional development, let us again refer to a historical scenario from the area of long-distance trade, but under significantly different institutional circumstances. Between the 10th and 13th century there existed a trader collective known as the ‘Maghribis’, who operated in long-distance sea-trade along the Northern African coast . Those traders shared a similar history and were a subset of local Jewish communities that had settled the Islamic Fatimid Empire that governed the Southern Mediterranean at that time. In contrast to the contemporaneous European traders of the Northern Mediterranean that operated in a heterogeneous and role-specialized institutional context, the Maghribis largely operated within an institutionally homogeneous environment sheltered by an Islamic legal framework that tolerated the coexistence of Jewish courts for the settlement of disputes among Jewish litigants. Given the relative tolerance of the rulers towards the Maghribis, they developed an intricate trade network that spanned the Northern African coast from Sicily to the Indian Ocean. Doing so, they inherently relied on reciprocity relationships to assure the mutual handling of goods and used multilateral monitoring and enforcement mechanisms to assure cooperation among each other. But these arrangements were not simply a matter of informal reciprocity, and the Maghribis had formal institutional instruments that were equivalent if not more refined than the contemporary European contracts, such as the commenda. So in this context it is of interest to look at the institutional innovations the Maghribis had to offer. They were trade specialists and relied on prompt delivery, flexible assignment and sending of goods, a multitude of relationships, and shifting priorities with respect to the remote market places they served. The multitude of relationships made formal contracts inefficient as they were specified on a per-venture basis and thus afforded higher transaction costs (while informal relationships were in principle open-ended with fixed rituals for initiation and termination). The fixed profits distribution and specification of obligations of either party further made formal instruments inflexible with respect to changing market conditions. In these circumstances the skilled nature of those trade specialists led them to employ institutional mechanisms that were only in part legally enforceable, but they preceded the existing legal system (maintained by K) with informal variants that one can interpret as labour contracts, a concept that was neither known to Islamic nor Jewish law. We see this as another example of the formative and bottom-up role S can play with respect to the development of institutions that are not backed by K, but whose existence is tolerated by C. History supports this C-S-K interplay perspective: in the 13th century the rulers (C) forced the Maghribis (S) to cede their trade operations and to reintegrate into the local Jewish communities. Figure 4 offers a schematic visualization of this process, in which the comparatively tolerant rulers, along with a largely compatible religious and normative systems (K), enabled initially local traders (S) to develop institutional instruments that met the coordinative requirements of long-distance trade (S), which then found wide-ranging adoption in Northern African trader societies and, despite limited legal enforceability, found introduction into the overall institutional framework capturing both formal and informal institutions (represented as K). The examples briefly outlined here show variety of different social scenarios, all of which show the applicability of the CKSW meta-model. More so, the model offers a blueprint to analyse their interrelations systematically, with the level of detail at the modeller’s discretion. In this paper we have presented the CKSW meta-model for social organizations in greater depth, offering a more explicit representation of the model and including a discussion of the interrelationships that constitute the model. We further applied the model to historic economic scenarios in order to demonstrate its explanatory power and generic nature. It is sufficiently precise, yet abstract enough to model the essential structure and interrelationships existent in any social system, ranging from primitive societies to modern civilisations, while accommodating different social levels. The model is informed by a range of theoretical underpinnings from the area of philosophy and economics (see Section 3). The CKSW modelling framework offers flexibility with respect to the conceptual abstractions that may be “plugged in” at the conceptual and implementation level. 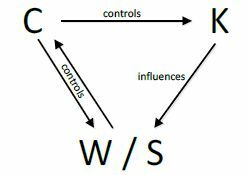 This may include, for example (a) opinion dynamics models  to represent W’s and S’s attitudes towards a C (and thus their propensity to seek its overthrow) or (b) the complexity of K-maintained institutions – whether concentrating on selected institution types (such as norms and a simplistic representation) or covering the wider institutional spectrum (such as is possible with nADICO , an extension of Crawford and Ostrom’s institutional grammar). Moreover, independent of whatever modelling metaphors may be chosen, we note that in view of the inherent context-dependence and subjectivity in which an individual acts, the employment of fuzzy representations can offer good approximations of the subjective and relative way in which individuals think and reason about their social environment [37,38]. (For example, imagine the contextually adjusted social identity  based on shifting group assignments.) So we believe that a systematic incorporation of fuzzy logic technology into a CKSW-based frame offers promising opportunities, and we will be exploring this direction in future work. With respect to the larger social perspective for which the CKSW meta-model is intended, we generally observe that wherever we turn we encounter a world characterized by a complex web of myriads of interlinked dependencies. These include individual motivations, such as drives for self-fulfilment, power and status, that are further obscured by social and cultural backgrounds – influences of possibly even greater complexity. As modellers we are constantly challenged to represent such complex social behaviour for which we do not have a precise understanding. On a more local basis and for the representation of the selfish individual, the folk-psychological BDI agent metaphor has gained wide-ranging popularity. However, as much as we may be satisfied with this folk-psychological abstraction, we are still missing the comprehensive ‘folk sociological’ counterpart that emphasises the possibly greater impact of social interactions on and by groups and the society at large. In the light of this modelling complexity and the different levels of observation, and more significantly, in light of the multi-disciplinary nature of social science, itself, the prospects of arriving at a single unified solution appears unrealistic. Instead, we can conceive ‘folk sociology’ more generally as a systematic collection of modelling approaches that offer abstractions suitable for the domains of interest, along with the theories (whether social-psychological, sociological, philosophical or economical, etc.) supporting those. We see the CKSW meta-model as a prototype of such nature, with possible applications in the area of economic and institutional modelling as well as peace-and-conflict research. Acemoglu, D. & Robinson, J. Why Nations Fail: The Origins of Power, Prosperity, and Poverty, Crown Business, 2012. Box, G. E. P., Draper, N. R. (1987). Empirical Model-Building and Response Surfaces, p. 424, Wiley. ISBN 0-471-81033-9. Ballantyne, D., & Varey, R. J., Creating Value-in-use Through Marketing Interaction: the Exchange Logic of Relating. Communicating and Knowing, Marketing Theory (2006), 6(3), 335–348. Ballantyne, D., Dialogue and its Role in the Development of Relationship Specific Knowledge, Journal of Business and Industrial Marketing (2004), 19(2), 114–123. Bratman, M., Intention, plans, and practical reason. Harvard University Press, Cambridge, MA, (1987). Brooks, R., A Robust Layered Control System for A Mobile Robot, IEEE Journal of Robotics and Automation, (1986), 2 (1): 14–23. Capra, Fritjof, The Web of Life, (1997) Anchor. Diamond, J. M. Guns, Germs, and Steel: The Fates of Human Societies, W.W. Norton, 1997, 480 pgs. Dreyfus, H. L., What Computers Still Can’t Do: A Critique of Artificial Reason, (1992), MIT Press, Cambridge, MA. Dreyfus, H. L., Being in the World: A Commentary on Heidegger’s Being and Time, Division 1, (1990) MIT Press, Cambridge, MA. Dreyfus, H. L. Heidegger on the Connection Between Nihilism, Art, Technology, and Politics, The Cambridge Companion to Heidegger, C. B. Guignon (ed.) (1993), Cambridge University Press, New York, NY, 289–316. Dreyfus, H. L., Intelligence Without Representation – Merleau-ponty’s Critique of Mental Representation the Relevance of Phenomenology to Scientific Explanation, (2002). Phenomenology and the Cognitive Sciences, 1(4), 367–383. Frantz, C.; Purvis, M. K.; Nowostawski, M. & Savarimuthu, B. T. R. nADICO: A Nested Grammar of Institutions. PRIMA 2013: Principles and Practice of Multi-Agent Systems, 2013, LNAI 8291, 429-436. Freitas, K., The Indian Caste System As A Means of Contract Enforcement, Essays on the Institutions of Caste and Dowry (Doctoral thesis), (2008), Northwestern University, Evanston, IL. Goldberg, J. L. Trade and Institutions in the Medieval Mediterranean: The Geniza Merchants and their Business World (2012) Cambridge University Press, Cambridge. Greif, A., Institutions and the Path of the Modern Economy, Lessons From Medieval Trade. (2006) Cambridge University Press, Cambridge. Greif, A., Coercion and Exchange: How Did Markets Evolve? (2008), Social Science Research Network, http://www.ssrn.com/abstract=1304204. Greif, A., & Tabellini, G., Cultural and Institutional Bifurcation: China and Europe Compared, American Economic Review, (2010), 100 (2), 135–140. Harris, R. The Institutional Dynamics of early Modern Eurasian Trade: The Corporation and the Commenda Journal of Economic Behavior and Organization, 2009, 71, 606-622. Hegselmann, R., & Krause, U., Opinion Dynamics and Bounded Confidence – Models, Analysis and Simulation, Journal of Artificial Societies and Social Simulation, vol. 5, no. 3, 2002. Heidegger, M., Being and Time, J. Macquarrie & E. Robinson (trans.) (1962 – original work published 1927), Harper Perennial Modern Classics, New York, NY. Hol, F. J. H., Galajda, P., Nagy, K., Woolthuis, R. G., Dekker, C., and Keymer, J. E., Spatial Structure Facilitates Cooperation in a Social Dilemma: Empirical Evidence from a Bacterial Community, PLOS One, October 2013, Volume 8, Issue 10, e77042, http://www.plosone.org/. Hucker, C. O., China’s Imperial Past, (1975), Stanford University Press, Stanford, CA. Kuran, T., The Scale of Entrepreneurship in Middle Eastern History: Inhibitive Roles Of Islamic Institutions, Entrepreneurs and Entrepreneurship in Economic History (2009), W. J. Baumol, D. S. Landes, & J. Mokyr (eds.) (pp. 62–87). Princeton University Press, Princeton, NJ. Kuran, T., West is Best? Why Civilizations Rise and Fall. Foreign Affairs, (Jan/Feb 2011), 159–163. MacCulloch, D., Putting the English Reformation on the Map: The Prothero Lecture, Transactions of the Royal Historical Society , Sixth Series, Vol. 15, (2005), pp. 75-95. Merleau-Ponty, M., Phenomenology of Perception, (1986 – original work published 1945) Routledge, London. Milgrom, P. R.; North, D. C. & Weingast, B. R. The Role of Institutions in the Revival of the Trade: The Law Merchant, private Judges, and the Champagne Fairs Economics and Politics, 1990, 2, 1954-1985. Mokyr, J., The Gifts of Athena, (2002), Princeton University Press, Princeton, NJ. Polanyi, M., The Tacit Dimension. Chicago, (1966), University of Chicago Press, Chicago. Preston, B. (1993). Heidegger and artificial intelligence. Philosophy and Phenomenological Research, 53(1), 43–69. Purvis, M. K. and Purvis, M. A., Institutional Expertise in the Service-dominant Logic: Knowing How and Knowing What, Journal of Marketing Management, (2012), vol. 28, issue 13-14, pp. 1626-1641, DOI:10.1080/0267257X.2012.742454, http://www.tandfonline.com/eprint/TvSEzfQc2U2tiwpenZWe/full. Ryle, G., The Concept of Mind, (1949), Hutchinson, London. Tajfel, H. & Turner, J. An integrative theory of social identity. The Social Psychology of Intergroup Relations, 1979, 33-47. Udovitch, A. At the origin of the Western commanda: Muslim, Israel, Byzantium Speculum, 1962, 37, 198-207. Zadeh, L. A. Fuzzy Sets Information and Computation, 1965, 8, 338-353. Zadeh, L. A. The Concept of a Linguistic Variable and its Application to Approximate Reasoning - I, Information Sciences, 1975, 8, 199-249. An institution can be represented by a single organization or a collection of them. This is also sometimes referred to as “know that”. Thus Gilbert Ryle (1949) wrote of the distinction between “knowing how” and “knowing that” . See also [10,11]. Note that Group, Organisation and Society are prototypical examples for social systems on different levels, without explicitly limiting itself to the modelling of those. The commenda, against wide-spread belief, originates from the Eastern Mediterranean and has mostly likely first been employed by Arabic traders before finding dominating adoption in European trade. In contrast to the European commenda, the Islamic and Jewish variant offered a more refined distribution of profits as well as obligations and liabilities. [19,35]. Despite their different religious affiliation, the Maghribis were considered musta’ribun and as such adopted a wide range of customs from the Muslim community they operated in .